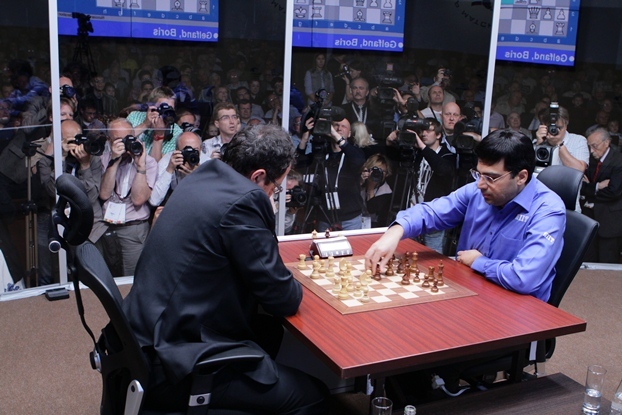 The 2012 World Championship match in Moscow ended with Viswanathan Anand retaining his title after beating Boris Gelfand in a thrilling tie-break. All 16 games of the match – 12 classical games and 4 rapid games – were covered live by Sergey Shipov, arguably the world’s best chess commentator and certainly the master of the difficult art of text commentary. All 16 games were also translated into English either by myself, Colin McGourty, here at Chess in Translation, or by Dana Mackenzie at his blog. Below you can find links to all the commentary and a viewer to play through the games that appeared at this site. 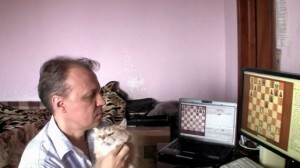 Shipov commentates for Crestbook.com, and the first link in the list of games below will take you to his commentary in Russian. The second link will take you to the English version, or in the case of “see viewer below” you can scroll down to the bottom of this page to play through all ten games that were translated here. Note that in the following viewer you can choose the game in the selector at the top left, while clicking on any of the main moves or analysis in blue will take you to that position on the board. You can also navigate with your keyboard’s arrow keys, or even make the moves on the board.